Paperback. New. Brand New. Standard delivery takes 7-12 business days by USPS media mail with tracking number. And expedited shipping for superfast delivery 4-6 business days by DHL/Aramex . We also ship to PO Box addresses .Customer satisfaction guaranteed and please feel free to contact us for any queries. Penguin Classics. PAPERBACK. 0143107526 Brand New! Not Overstocks or Low Quality Book Club Editions! Direct From the Publisher! We're not a giant, faceless warehouse organization! We're a small town bookstore that loves books and loves it's customers! Buy from us and you get great service as well as a great price! Your business is valued and your satisfaction is guaranteed! . New. Penguin Classics. PAPERBACK. 0143107526 Remainder mark . Fine. Penguin Classics. PAPERBACK. 0143107526 . New. Penguin Classics. PAPERBACK. 0143107526 *BRAND NEW* Ships Same Day or Next! . New. Penguin Classics. PAPERBACK. 0143107526 *LIKE NEW* Ships Same Day or Next! . Fine. 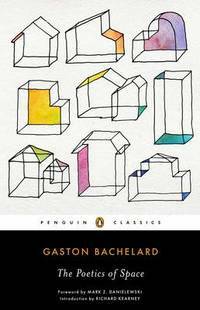 by Gaston Bachelard (Author), et al. Paperback. New. Beloved and contemplated by philosophers, architects, writers, and literary theorists alike, this book examines the places in which we place our conscious and unconscious thoughts and guides us through a stream of cerebral meditations on poetry, art, and the blooming of consciousness itself. Penguin Classics. PAPERBACK. 0143107526 Special order direct from the distributor . New. Penguin Classics. PAPERBACK. 0143107526 Like New Condition. . Fine. 2014-01-06. Good. Ships with Tracking Number! INTERNATIONAL WORLDWIDE Shipping available. May not contain Access Codes or Supplements. May be ex-library. Shipping & Handling by region. Buy with confidence, excellent customer service! PENGUIN. New. 7.73 x 5.19 cm. Penguin Classics. PAPERBACK. 0143107526 New Condition. . New.